Some folks were a bit wary of a request this week from a Denver metro group for financial assistance with a water project that local water leaders were concerned might facilitate water exportation from the San Luis Valley to the Front Range. Eric Hecox, executive director of the South Metro Water Supply Authority, asked members of the Rio Grande Basin Roundtable water group this week for $10,000 from the roundtable’s basinallocated funds for the WISE (Water, Infrastructure and Supply Efficiency) Project. Hecox made his initial presentation this week and will return next month with the formal funding request. He told local roundtable members he had already visited the other eight basin roundtable groups throughout the state and they had been supportive of putting $10,000 each into this project in an effort to show cross-basin cooperation and support for local projects. Hecox said the basin support would help leverage money from other sources and serve as a cash match. He said while most of the basin roundtables committed to $10,000 each, the metro basin committed $40,000 and the South Platte roundtable $15,000 towards the WISE project. 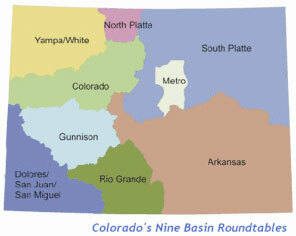 Hecox explained that the South Metro Water Supply Authority is made up of 13 independent water providers that serve areas like Highlands Ranch, Parker and Castle Rock. What brought these groups together, Hecox explained, was their common issue of having non-tributary nonrenewable groundwater as their water supply. The group has been working together towards a better water source solution since the 1960’s and 1970’s , Hecox said, and had participated in the Two Forks Project, a dam project that never materialized . “Two Forks going away didn’t change the need for storage,” he said. To roundtable member Charlie Spielman’s comment that Two Forks was being built one gravel pit at a time, Hecox said rather than one big bucket, there are lots of smaller buckets filling that same need, and there are a lot of gravel pits being used for water storage. “That’s not a component of our project,” he said. The authority has tried to reduce water use through significant conservation efforts , he added, and the per capita water use in their communities has decreased by 30 percent since the 2000’s . The latest idea prompting the WISE project is to partner with Denver and Aurora water providers, which do have renewable supplies, to reuse their municipal effluent , Hecox explained. The WISE project will encompass a treatment facility that will treat that water so it can be distributed to participating communities through existing pipelines. The authority purchased the pipeline for $34 million, Hecox said, which is being changed from its original use to be used for this project. The authority will pay Denver and Aurora $5.50 per thousand gallons to use their water supplies, pipe the water, treat it and distribute it to about two million people in the South Metro Water Supply Authority area. Groundwater and surface water will be comingled in the pipeline, Hecox explained . He said the funding being requested from roundtables as a local match will help build a treatment plant for the groundwater, which will cost about $6.4 million. The authority is combining $5.4 million in matching funds and will submit a grant request for $915,000, according to Hecox. Hecox said the Rio Grande Roundtable should support this project because it addresses the statewide gap between supply and demand and because it would support the new approach of regional partnerships to address water issues throughout the state. Hecox said that the communities in the South Metro authority have, much like many water users in the Rio Grande Basin (San Luis Valley), relied on groundwater resources, so they are trying to become mores sustainable, and the option of reusing Denver/Aurora effluent is one method of accomplishing that. The WISE project will allow area water resources to be reused multiple times, Hecox explained. The water that the authority will be buying from Denver and Aurora was previously going down the South Platte, Hecox said. “This will use water that was going downstream,” he said. He added that Aurora had a few short-term leases on its water previously, but this would be a permanent one. The authority is guaranteed supplies from Denver and Aurora until 2030, he said. Roundtable member Steve Vandiver, general manager of the Rio Grande Water Conservation District, said this seemed to be opening up a new distribution system for the entire metro area that would make it easier to import water from other parts of the state, such as the Valley. He added that there is an export project currently proposed in the northern part of the San Luis Valley, and there have been continuous overtures over time from water speculators wishing to benefit from exporting water out of the Valley. It would seem that the WISE project would fit right into their plans, he said. Hecox admitted the WISE project would not meet all of the metro water needs in the future, and the authority is looking at other water sources such as a cooperative project with Denver and the West Slope as well as an alternative agriculture transfer program in the South Platte Basin. He said when the authority began the WISE project it was looking at a need for 60,000 acre feet of reusable supplies. With the WISE project, the authority is now looking in the 15,000-30 ,000-acre-foot range “above and beyond this,” he said. Vandiver said the likely plumbing for any export from the San Luis Valley would be through the Arkansas Basin. Hecox said when this project began, Denver water leaders were concerned their water would be used for additional growth in Douglas County, and there are areas that are zoned, platted and designated for development, but the houses have not yet been built. He added that developers in Douglas County had not yet approached the metro water authority or its members to use the WISE project water. He said the purpose of the WISE project would be to reuse existing water supplies for existing communities. The roundtable took no action on Hecox’s request this week but may do so next month.